We have a lot to celebrate. Jack’s fourth birthday is today. Regan wrapped up his last day of work with his former employer on Friday and started a brand new gig today. It was forty degrees out this weekend and our grey and icy world finally began to thaw. Plus it’s Valentine’s Day. 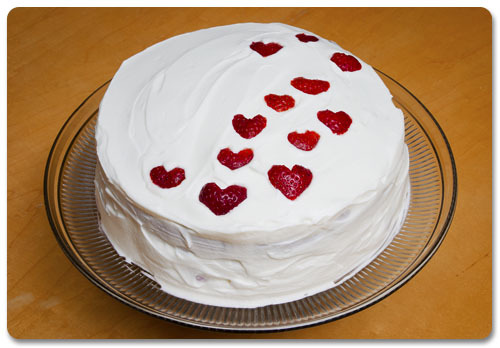 While we don’t normally celebrate any one thing in a big way, a spring-like, festive cake seemed to be in order this weekend to help celebrate all the good things in our life. Lately I’ve been dreaming of summertime parties in our backyard with white fairy lights strung in the trees, picnic tables with good friends gathered around and fresh fruit and layer cakes in abundance. All those dreams got me searching for the perfect cake this weekend. 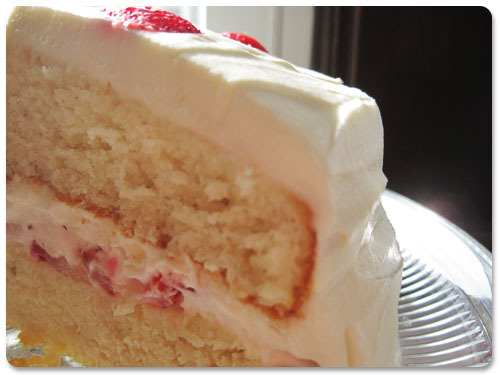 I settled on the Classic White Cake Layers at epicurious. The layers turned out dense and moist, perfect for keeping shape. The only change I made was to add two teaspoons of almond extract to the batter. Once I figured out the layers, I had to figure out how to accessorize them. I thought about chocolate frosting, something dense and decadent, but ultimately some classic whipped topping and strawberries won me over, paired with some chocolate ice cream, of course. 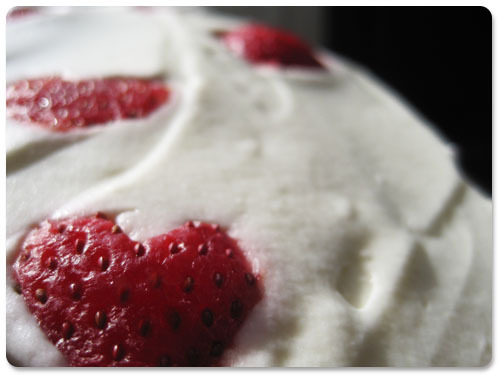 I sliced a pint of strawberries thinly, letting them soak in a bowl with two tablespoons of sugar, then placed them in a thin layer between the two layers along with some heaping spoonfuls of whipped cream frosting. The whipped frosting is stiff and smooth, made from eight ounces of cream cheese, one teaspoon of vanilla extract, one half teaspoon of almond extract, one and half cups of white sugar and two cups of heavy whipping cream beaten until stiff peaks formed. It turned out just as I’d hoped and tasted like summer. It looked just right for Valentine’s Day as well. 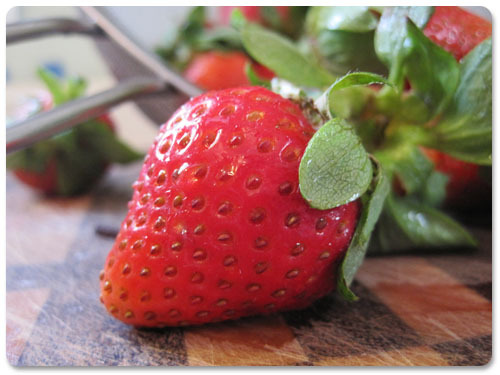 The leftover strawberry ends, altered just slightly with a paring knife, made for perfect little decorations on top. I think I might now have a new favorite cake. It was the perfect addition to a decadent and celebratory weekend. Um, I think this is going to be my new favourite cake recipe. 🙂 I will have to try it out next month as we have some birthdays coming up around here. But I’ve not seen any strawberries that lovely since last summer! The frosting sounds to-die-for! It is pretty out of sight. My co-workers confirmed that when I brought it to work this week. Can’t wait to see your version. I bow down to your cake-making abilities! YUM! and so beautiful too! Love the hearts, they look like they’re floating away. Claire, you never cease to amaze. That looks like it belongs in a shop window somewhere. You have more creativity and craftiness in your pinky finger than I’ve got at all. So lovely! Thanks, Lisa. Just so you know, you never cease to amaze me with your undeniable business skills and movie knowledge, building awesome festivals and events!